Awesome Article About the Headhouse!!! In this month's issue of Philadelphia Style Magazine, the Headhouse Farmers' Market is profiled! What an honor to see some of our friends at the Headhouse make it into print! The article profiles the market in general and it's history, but also mentions some of our favorite vendors specifically like Tom Culton from Culton Organics (nice photos Tom), Matt Yoder of Yoder Heirlooms (a vendor we at the Feed highly recommend, everything we have ever purchased from them has been stupendous and Matt really knows his stuff), Ben Wenk from Three Springs Fruit Farm (a Philly Food Feed Friend), and others. Be sure to give this article a read and when you see these vendors next time you are at the Headhouse, give them a shout-out and a hearty handshake. These people are helping put the Philly farmers' market scene on the map! We actually visited the Headhouse on Sunday morning, which is our custom. We picked up pounds of peaches from Three Springs that have already made it into my cereal and into the baby's food. And speaking of Tom Culton, we purchased some heirloom tomatoes which adorned last night's salad and a cauliflower which we also ate last night with zeal. And even though we aren't Philadelphia Style Magazine (lol), Tom graciously let us sneak a quick pick of him and his pheasant feather crown which Tom explained was made by his girlfriend. Speaking of last night's salad, I would be remiss if I didn't mention the heirloom sweet chocolate peppers that were also included. 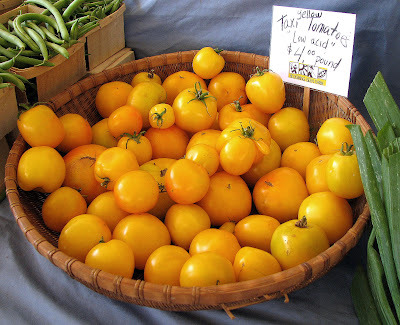 We purchased these earthy, attractive, mildly flavored beauties from Yoder's Heirlooms, specifically from Matt Yoder. As stated earlier, Matt always has a variety of exotic heirlooms on hand and will tell you about them with a knowledge that could only come from passion. Visit Matt next time you are at the market and ask him to tell you about what he's got. You will get an education AND some really great produce. When it comes to food, one of the things that we are doing is working with school districts. And the child nutrition legislation is going to be coming up. We provide an awful lot of school lunches out there and -- and reimburse local school districts for school-lunch programs. 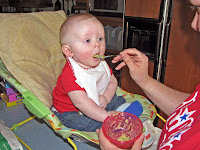 Let's figure out how can we get some fresh fruits and vegetables in the mix. Because sometimes you go into schools and -- you know what the menu is, you know? It's French fries, Tater Tots, hot dogs, pizza…it turns out that that food's a lot cheaper, because of the distributions that we've set up. 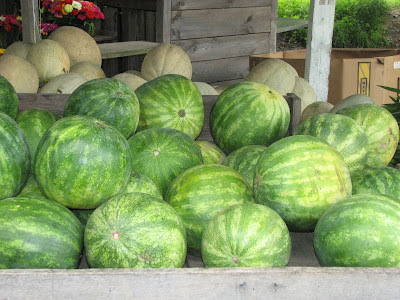 And so what we've got to do is to change how we think about, for example, getting local farmers connected to school districts, because that would benefit the farmers, delivering fresh produce, but right now they just don't have the distribution mechanisms set up. OK Mr. President! Sounds great! The intention is there! So let’s see what we can do about setting up this infrastructure. The other day I wrote about the recent law passed in Illinois that mandates local food purchases from state agencies to the tune of 20% of all purchases by 2020. We already have a National Student Lunch Program, among other federal programs that subsidize student meals at schools and other non-profit agencies. Why not a national law that mirrors the Illinois statute? A mandate that a certain percent of lunches in each state under the federal program come from foods produced locally within each respective state? Perhaps it could be an amendment to the Energy Bill currently being knocked around Washington. There can only be a reduction of greenhouse gases in the atmosphere if this food doesn’t have to travel as far. Furthermore, creating a local food infrastructure can help create jobs that can’t be exported. Local fresh foods for children? Jobs? Sounds good to me. When we got there, it literally was a square of stands stretched out over a field. Right off the side of the road! 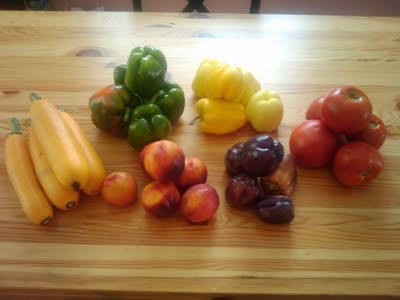 Emily and I decided with our paltry FM (farmer's market) budget this week, we'd window shop before plunking down. Now me, I love peaches. Peaches (and pears too) have that fine line between sweet, juicy perfection, and feeling like a peach flavored apple. 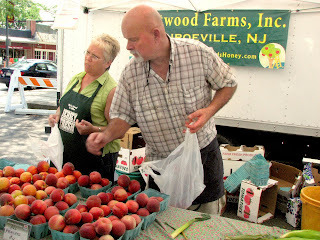 We'd been getting peaches downtown at the Headhouse Farmer's Market, and they had finished their season. Good thing there were plenty of peaches to pick from here. The price was great! And those peaches were DELICIOUS. But it really is the end of the season; it was a race against time to eat those peaches and frankly, we lost. On a side note, one of those "there's two kinds of people in this world" things... Evidently, I eat peach skins and Emily doesn't. And we both think we're weird for not doing what the other does! There were tomato and basil chips. It was great to taste flavors you normally don't get in a chip. I don't think I got a picture of it, but next to Brad's was a bread guy. He made brownie bread! Is it bread? Is it a brownie? It was delicious either way. He'd slice off a bit and offer it up without a second thought. Here's where we got a lot of our veggie produce. As Em will tell ya, I'm trying to shed a few pounds (who isn't? ), and big, juicy salads are the way to go. The open field really added to the environment and ambiance. Some just came to enjoy the beautiful day. Now another thing I like to grab at the FMs is bread. I've always loved bread, and fresh local bread hits the spot like nothing other! When I was living in Castor Gardens, I would frequent the local bakeries for a good loaf of rye, or some Amaroso rolls. Now, I get my bread treats at places like this! And Wrightstown did not disappoint. This guy was selling tomato pie, and while I didn't have enough to grab one, I made sure to set some green aside for a loaf of Italian bread - seeds included please. He was selling crab sauce too. Great guy, made friends right away! 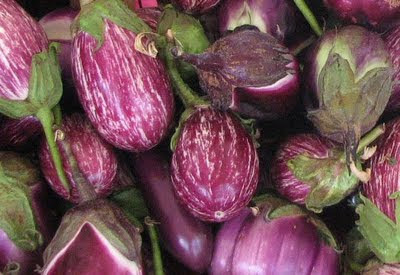 Check out these eggplants and flowers! Well, we'll definitely be back to the Wrightstown Farmer's Market. It screams summer and it's a fun spot for those seeking a simple pleasure on a beautiful day. This past Tuesday, Governor Pat Quinn of Illinois signed the “Local Food, Farms and Jobs Act” into law. This law mandates that state agencies in the state of Illinois will be required to purchase at least 20% of their food from within the state by 2020 and that state-funded institutions, such as schools, have a 10% mandate. Moreover, when purchasing food, these state and state-sponsored agencies will have the power to pay a little more than the lowest bid if the food they are buying is produced locally. The genesis of this law can be traced back to a report released in January by the Illinois Local and Organic Food and Farm Task Force. This report stated that essentially, Illinoisans spend 48 billion dollars a year on food, but out of that only about 5% of that number is being spent within the state. The study by the Farm task force further states that by supporting smaller Illinois farmers, $30 billion new economic activity could be generated state-wide each year. The advantages of this law are numerous. First, the environmental impact cannot be overstated. While 80% of Illinois is farmland, by importing most of their food, the average mileage traveled from farm to table for a vegetable in Illinois is 1500 miles. 1500 miles of shipping and refrigeration that can be avoided from buying from somebody in your backyard. Furthermore, smaller local farmers tend to be more diversified in their crop selection, which lessens the dependence on fossil fuel based fertilizers and pesticides. Secondly, by granting permission to state agencies to purchase local food, the opportunity for children in the inner-cities of Illinois to have healthy choices in what they eat increases. Unfortunately for some children, food received from state aid is their only source of nourishment. Perhaps if the food is healthier, these children will have a chance at a better life. So there it is. We need to watch Illinois closely in the upcoming months to see how this all pans out. If all goes according to plan, Illinois can be a shining example of how environmental, moral, and economic imperatives do not have to be mutually exclusive. Worse comes to worst? Children get access to healthy local food. Sounds good to me. Well, the Huffington Post is at it again! Some of you may remember a little while back, Huff Po asked their readers to submit their favorite farmers' market pictures. The Food Feed actually made an appearance with a picture of the bounty at the Headhouse Market! Anyway, they are at it again, but this time, they want to know the best cities in the country for local food! Farmers' Markets, eateries, microbreweries, festivals - they want to know which city can boast that it's the best. Well we here at the feed know that there can be none better than the City of Brotherly Grub! Come on people! Go to the Huffington Post and submit your favorite local food eatery or tell them Philly needs to be mentioned! Hello to all of you who have followed the link from the Food Trust newsletter! This is The Philly Food Feed! We are explorers who venture throughout the Philadelphia area in search of fresh food, friendly farmers, convenient Co-ops, etc.! Please take a look around, look at some of our older posts, and leave a comment if you are so inclined. Thanks for stopping by and WELCOME!!! I sure hope that when you come here to read about local food, you are taking time out to check out the links posted on the right. Or the left, I can never really tell if it's my left or the computer's left. Regardless, if any of you want to learn more about the local food movement, click on some of the links and get an education. A friend of mine from Middle School and High School, Faith, just turned me on to a cool "pick your own" out in the Lehigh Valley. While I have not seen Faith in over 15 years, through the magic of the internet (Facebook) we have reconnected and are now able to share local food hot spots. And now I can share them with you! Go internet! "We hit a PYO place on Friday afternoon in New Tripoli with excellent peaches, blueberries, blackberries, plus a bunch of stuff they already picked, too. 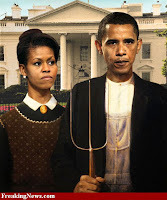 It's called George Schmidt berry farm. Apparently my parents took me there exactly 30 years ago because it was when my mom was expecting Mikey and he turns 30 on Sept 2nd." What a rousing endorsement, with an added family anecdote to boot. We here at the Feed hope that Faith continues on her local food pursuits and let's us know how she is doing. And if you are ever out in the Lehigh Valley and want some "excellent" peaches, blueberries, blackberries or the like, check out George Schmidt's Berry Farm! On her recent trip home from the shore, Dana, an old friend of the Philly Food Feed stopped off on rt. 38 in Burlington County at a roadside stand, and boy was she impressed. Check out the bounty she hauled in for 15 bucks! While we don't have a name of the stand, this type of find is just a testament to the fact that you don't have to look all over for fresh local food, most of the time, it finds you! Thanks to Dana for the info! If anybody out there in Philly Food Feed land ever visits a market, CSA, Co-op, etc., and wants to share...please feel free! E-mail us at benjamin82877@gmail.com and we will be sure to mention you! Thanks! Patches of Star - the PW has a penchant for the black raspberry pastured goat's milk ice cream dished out from Patches of Star. This is some of the Headhouse fare that we at the Feed have yet to try. You would think that after spending week after week here, we would have. Needless to say, we will be next Sunday! Wildflour Bakery - PW highlights the sourdough from Wildflour. You can pick some of this up at the Headhouse. Wildflour is what I would call superlocal - right in Northeast Philadelphia! Hilacres Pride - while Hilacres already offers Raw Milk at the market, PW pays special attention to their butter made from pastured cows. This is yet another of Headhouse's offerings we at the Feed have yet to try. It makes me wonder what we are doing there every Sunday! This is on our shopping list for the next time, that's for sure. PW compares it to Banana Ice Cream. Wow! Three Springs Fruit Farm - Finally, kudos to Ben Wenk and the rest of the people at Three Spings Fruit Farm! The Philadelphia Weekly sings the praises of their cider. We at the Philly Food Feed have not yet partaken in this liquid bounty but will be sure to do so post haste. And not just because Ben mentions us on his website either...lol. We at the Feed are constantly snacking on Three Springs' peaches and nectarines. How we have not already tried the cider, I don't know. Thanks PW for turning us on to this...and thanks to Three Springs in advance for cider that, if it's anything like the donut peaches, will be nectar from the heavens! It is my pleasure to crow about the Philly Food Feed's recent appearance in "Fresh Picks", the weekly newsletter from the Lansdowne Farmers' Market. While we at the Feed blog purely for the joy of finding and eating local food (wink, wink) it is always nice to get kudos from those who appreciate our work. Incidentally, if you live in the Lansdowne area, you should definitely subscribe to this wonderful newsletter. 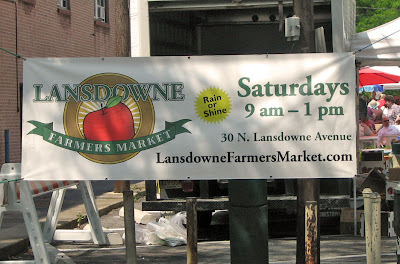 Not only does it have news about the market, it has news about other various happenings in Lansdowne. After you read it, give a second to subscribe! By the way, one of the blurbs from the newsletter mentions Mark Skinner and Natural Meadows Farm. You might remember me mentioning Mark before; we at the Feed buy our eggs and ground meat from him when he's at the Headhouse on Sundays. We talked to Mark last week during our visit to the Lansdowne market. It seems that it was his first appearance there, but not his last! Look for him there on Saturdays for the forseeable future. Besides the obvious fact that grass-fed animals are treated better because it is their natural way to eat, the health benefits of pastured meat and eggs cannot be stressed enough! Animals raised on grass are then to be richer in antioxidants; including vitamins E, vitamin C, as well as beta-carotene. Also, no antibiotics!!! 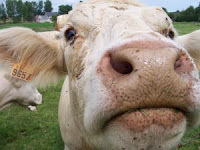 Moreover, because of their grass diets, pastured animals are higher in "good fats", Omega-3s. People with high amounts of Omega-3s in their diets are 50% less likey to suffer from heart attacks! There are many other benefits as well! Check out eatwild.com for the full run down; you won't be disappointed and you will learn something to boot. 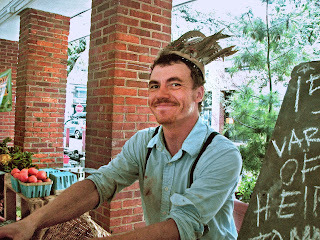 And don't forget to look for Mark Skinner and Natural Meadows Farm at Lansdowne and at the Headhouse! It just tastes better! What: A free celebration of edible education. Visitors will learn about the origins of their food, methods of healthy and sustainable urban agriculture, and how they can get involved. Plus: Meet Food Trust staffers and learn more about The Food Trust. When: Friday, August 7th, noon to 4 p.m.
Where: Outside the National Constitution Center, 5th and Arch streets. Our e-mail address has changed. We are no longer at benjamin828@comcast.net. The new address of the Feed is benjamin82877@gmail.com. Thanks! During Sunday’s trip to Headhouse, I had the pleasure of meeting Chef Mitch Prensky, Executive Chef and Proprietor of Supper Restaurant, located on 926 South Street in Philadelphia. Some of you may already be familiar with Chef Prensky through his catering of the pancake breakfast fundraiser at the Headhouse in June. We discussed the virtues of local food and I found out that Supper will be offering a Farmers’ Market Tour and a “Three Course $38 Sunday Supper” on Sunday, August 16th, Saturday, September 5th (tour on Saturday, meal on Sunday), and Sunday, October 5th. For a $20 dollar supplement to the dinner, you can actually tour the Headhouse Market with Chef Prensky and help him plan the monthly menu for this supper! This is something I recommend people – you have to admire a chef that appreciates the nuances of fresh, local food and incorporates it into his cuisine. Plus, by taking the tour, you can learn the tricks of the trade! Who better to learn from than a chef - especially with the credentials of Chef Prensky! Check out his website and take a gander at the various articles gushing over his food and when you are done, call him and make a reservation for the supper! National Farmers' Market Week - What a Weekend! It’s National Farmers’ Market Week! This week when you attend your local market, make sure you let the people there know how much you appreciate what they do for you and your community! With the help of local farmers, consumers have the choice of purchasing fresh, healthy, food which benefits both the consumer AND the local food shed. We here at the Philly Food Feed love the farmers and the farmers’ markets so we kicked of the Farmers’ Market Week early this past weekend and wow…what a weekend! The Philly Food Feed made its presence known at two farmers’ markets this weekend, one of which was for the first time! On Saturday the Food Feed made our first appearance at the Lansdowne Farmers’ Market and we are better for the experience. Not only did this market offer a plethora of fresh, locally grown, fruits and vegetables, this market also has the added benefit of live music! So there we were, Sarah, Ethan, and I grooving from vendor to vendor, checking out all the local wares. 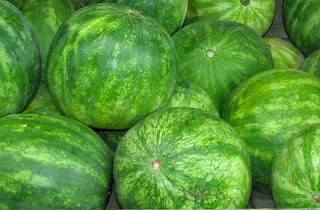 Kudos to the market manager, Rick Grocottt, who obviously manages this market with an extra dose of TLC. You can tell this by the organized set-up of the marketplace, as well as his amiable disposition and his willingness to impart as much information as we needed about the market I took a picture of Rick for the Feed but his eyes were closed and I didn’t want everyone’s first impression of him to be from a sleepy looking photo. Sorry Rick! Vendors of note include Louise Bierig from Lupine Valley Veggies. We bought some organically grown fresh parsley from Louise which we put on our salad yesterday. The fresh taste really spruced that salad up, that’s for sure! We will definitely be visiting Louise again for more herbs; she was very gracious AND affable. What a combo! Some food for thought there. I read it while eating a Fruitwood Nectarine so it went down nice and easy! 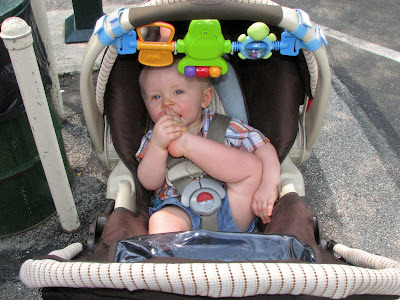 With all of the delectable produce offered at Lansdowne, I can’t understand why Ethan feels the need to eat his foot. Try a blackberry for cripe’s sake!!! So that was Saturday. We will definitely be back to Lansdowne again, that’s for sure! Moving on, what weekend would be complete without our obligatory visit to the Headhouse Farmers’ Market in Philadelphia! Although the weather resembled impending doom, there is nothing that can hinder the Feed’s pursuit of the freshest, tastiest, local food. Check out what we had to go through on our way home! And from the size of the crowd at Headhouse, we weren’t the only ones! I spoke to Katy Wich, the benevolent market manager who informed me that the market now carries Raw Milk, a coveted item among local foodies. If Raw Milk is your bag, be sure to pick some up at Hillacres Pride. Katy also has informed me that Griggstown Farm will be bringing 4 types of quiche made from eggs from their chickens as well as the chickens from a neighboring farm. Looks like I’ll be back on Sunday! 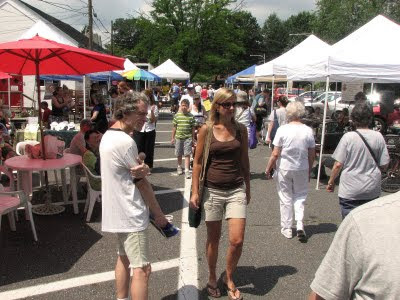 (As if I wasn’t going to anyway).Incidentally, managing a large farmers’ market like Headhouse can be really hard work. Every week that I’m there, I see Katy flying around, making sure everyone and everything is situated. She works her tail off to make sure we have access to the wonderful food at the Headhouse. If you see her there, make sure to say hello and thank her for all of her hard work! As I mentioned before, this week is National Farmers’ Market week. If you are so inclined, take the time to make a donation to the Food Trust. 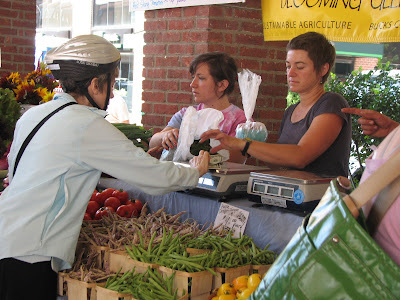 While purchases at the markets do help support the farmers, the Food Trust counts on donations to help support the management and operations of the those markets. In other words, without them, we don’t get our peaches, quiches, eggs, etc! So let’s give them a hand, shall we?